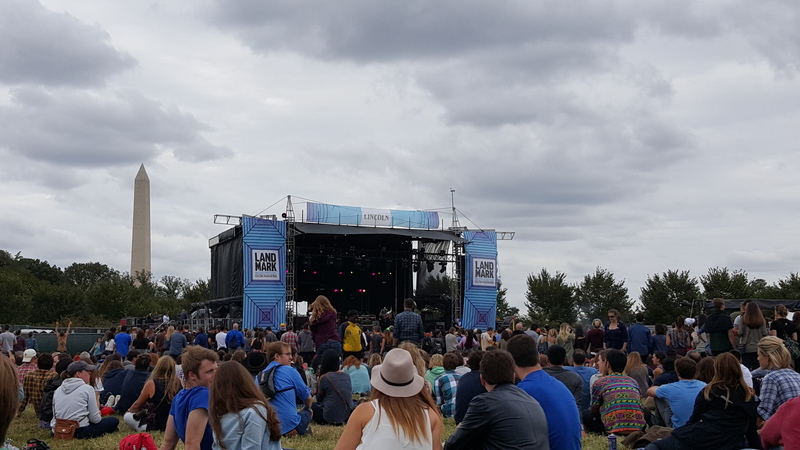 This past weekend I went down to DC on Saturday and Sunday for the first Landmark Music Festival in West Potomac Park. Supposedly it was a fundraiser for the National Mall, but I’m dubious about how much money they actually would have made. I actually got my tickets on some special early, early bird sale so the tickets for both days only cost $100. That is a killer price for a music festival, so I was quite happy about that. I was also quite happy that the original weather forecast did not pan out. Even as late as Friday morning they were saying it was going to rain all weekend. I even went out Friday after work and bought rain boots and ponchos especially for the festival. Luckily by Saturday morning the Saturday forecast was much better with only a small chance of showers. Sunday was still supposed to be rather rainy though. We did get rained on some during the final set of the evening (or at least the final set we stayed for. We didn’t stay for the headliners either night because neither of us cared about Drake or The Strokes), but it wasn’t bad. Then the best of news was that the Sunday forecast changed and pretty much removed rain altogether. It wound up being almost perfect festival weather. In the low-70s and cloudy so you weren’t baking in the sun. Well done weather. Being the first year of the festival there are definitely some kinks that need to be worked out if they plan on continuing it in future years. Mostly they just need more services. If you didn’t go at the exact right times the lines for food and bathrooms were way too long. I don’t drink and brought my water bottle to fill at the water stations so I didn’t have to worry about the out of control bar line, which was the only place to buy drinks alcoholic or non. They did seem to alleviate that problem a great deal for Sunday, but the Saturday lines were definitely a horror show. My other complaint is that they tried to shove too many stages in too small of a space. I appreciate that they were trying to include as many bands as possible, but the noise bleed between stages was nuts. I have never been to a music festival where one stage’s music overpowered others as much as this one did. The set up was basically 2 stages with alternating sets on one end of the park and 3 stages on the other end of the park with the medium stage alternating with the main stage and small stage that played at the same time. That side really boggled my mind. Why would you put two stages literally within shouting distance of each other where bands were playing at the same time? The music was so loud from the main stage and with the speakers pointed at the exact direction of the other stages that even on the other side of the park when the middle stage on that side was playing at the same time the main stage often overpowered it. If they eliminated the small stage and kept 2 stages on either side of the park and repositioned the two main stages so they weren’t pointed across the entire park I think it would work out fine. I did appreciate that they seemed to schedule the bands according to genre and the bands that most likely people would want to see together. We basically spent the weekend just going back and forth between two stages and if we didn’t actually care to be up close we literally could sit in one spot and turn around and be at the back of the crowd for both stages. That was convenient. There was a really great lineup for the festival, though I can’t say I was super blown away by any of the acts. I feel like maybe we’re beyond peak festival at this point and that the bands are kind of over it too, especially this late in the festival season. I imagine that it’s not as gratifying to be playing for crowds of people who probably aren’t there to see you necessarily and aren’t really paying that close of attention to the music because most of them are there to get wasted and hang out with their friends. Though I felt like the crowd wasn’t quite that bad at this festival because it’s not a camping festival. The crowd of course was mostly twenty-somethings, but there was also a decent number of older people there as well as some families with kids. They did have a kids activity area, so that was nice. It wasn’t as family friendly as the Newport Folk Festival, but I did appreciate that they were reaching out to families. Saturday we saw The Hunts, which I only became aware of because of this festival. They’re a great folk band out of Chesapeake, Virginia. They were probably my favorite act on Saturday, and I definitely look forward to hearing more of them. Saturday we also saw the Mowgli’s (whose stupid apostrophe I will never get over), Daughter, Band of Horses, Ben Howard, Nate Ruess, and The War on Drugs. Sunday we saw Hiss Golden Messenger, who I was happy to see since I missed their set at Newport this year. Same goes for Lord Huron. 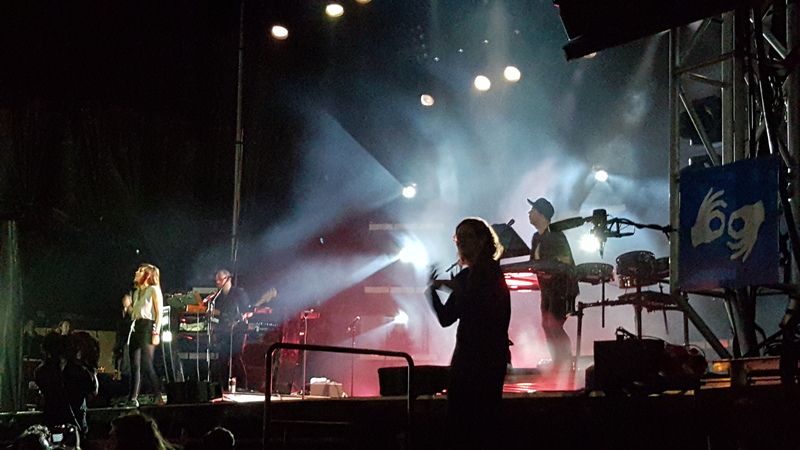 We also saw Houndmouth, The Joy Formidable, Chromeo, George Ezra, and Chvrches. I have to say that I didn’t really care about seeing Chromeo and would probably never sit down and listen to his music, but he probably put on the most entertaining set I saw over the weekend and the people watching during it was stellar. 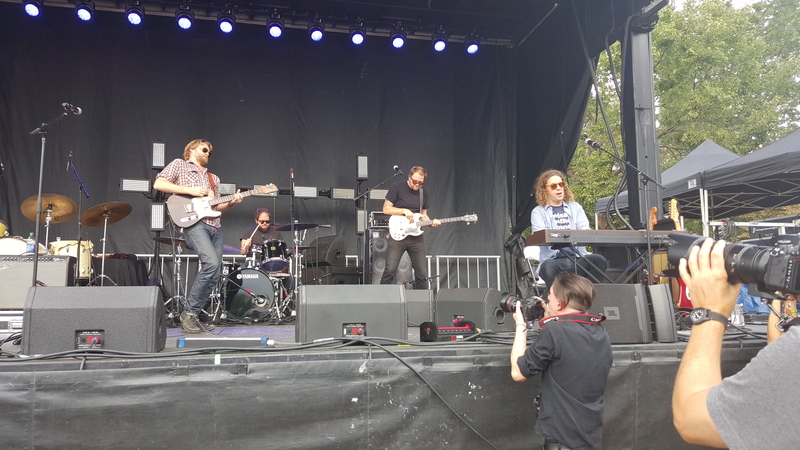 I also realized at this festival that most of the bands that were at the top of my list to see (Hiss Golden Messenger, The War on Drugs, and Ben Howard) are all kind of folky rock/jam bands who tend to have long guitar riffs in the middle of their songs. I really enjoy their music, but I have to say that none of them are terribly compelling to watch on stage. At least Hiss Golden Messenger looked like they were having a good time during their jams. Chvrches was the number one band on my list though. I’ve been dying to see them again since I saw them at the Firefly Music Festival a few years ago. We managed to stake out spots in the front row, which was great for seeing them but maybe not so great for my hearing. Even with earplugs in I felt like I was being blasted away. I can’t imagine how deaf everyone without earplugs was. They were still great. I love their lead singer Lauren Mayberry. She is a lot of fun. I once listened to her on the Nerdist podcast and she said she got a lot of complaints from people who hate how much time she spends talking during their sets. I think they’re nuts, because I love it. I think their second album that came out last week is even better than the first, so it was great to get to hear those songs live. Hopefully won’t be so long before I get the chance to see them again. It wasn’t a perfect festival by far, but I would still be willing to go back again in the future if the lineup was compelling enough.